Star® Burner. 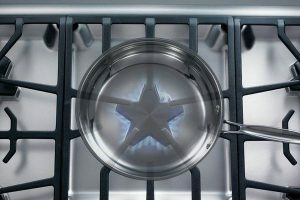 The Star® Burner’s unique shape isn’t just for show. It creates a perimeter 56% longer than a round burner of the same size, which allows the inclusion of more flame ports. The result is a stove burner that delivers superior flame spread and a reduced cold spot for faster and more even heating across any size pan. The ExtraLow® feature provides the widest variety of temperature control of any simmer system. It cycles on and off to maintain temperatures as low as 100°. Perfect for simmering delicate sauces or keeping food warm without scorching. 22,000 BTUs. High temperatures when you need them on each burner. The Thermador True Convection system directs heat to cook food faster and more evenly with gourmet results. SoftClose® Door New Hydraulic SoftClose® hinges prevent slamming and ensure ultra smooth closing of the oven door. 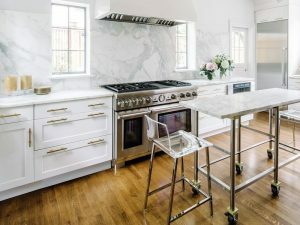 Achieve your biggest culinary dreams with a Thermador 48-inch range: the epitome of luxury and flexibility in the kitchen. From moist chocolate soufflés, to juicy and crispy roasts, to vegetables grilled to perfection, Thermador 48-Inch Pro Harmony® and Pro Grand® ranges help you take every dish to new heights. The Thermador 48-Inch Pro Grand® Steam Range is the only 48-inch range to offer seven cooking options, including an award-winning steam and convection oven, exclusive Star® Burners, and a convenient warming drawer. Expect faster, easier defrosting, steaming, baking, and reheating with the range that’s like no other. You can find the full line of Thermador Appliances at all three Arizona Wholesale locations. Call today and make arrangements to visit one of our convenient locations.